There are many things that you can attach to the USB port on your computer. Some of them are frivolous, but some of them are really useful, such as a USB digital handheld microscope. 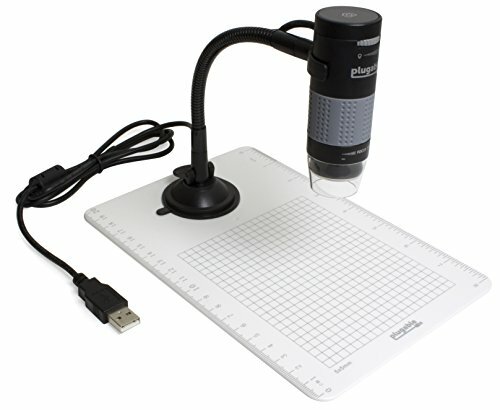 A digital USB microscope makes it easy to save and record your work and are a perfect choice for the modern scientist. You can use the microscopes to know if you have house dust mites. Unfortunately, there are a lot of these USB-pluggable digital handheld microscopes on the market. The following is a look at five of the absolute best, as well as a look at what constitutes the best digital handheld microscope. Image quality is one of the most important things for a microscope; digital or not. If you’ve ever used a digital camera you know that the image quality can degrade when you zoom in. The same is true of a digital microscope. This can be a problem given how much you zoom in with a microscope! Ensure that the digital microscope you use retains a high-quality image no matter how much you zoom in. Another important thing for any microscope is magnification level. A digital microscope might claim to zoom in to 500x but, when you actually open it up, you’ll find it doesn’t get anywhere as close as that. Get a microscope that really can zoom in to the magnification level that it claims it does. The microscope must be easy to use. If it isn’t you’re going to run into a lot of problems. Find a user-friendly microscope to get the most out of it. Avoid overly complicated ones with too many buttons or unclear instructions. Ask yourself how well put-together the microscope is. Is it sturdy or is it made of low-quality materials and not assembled very well? Construction quality is the difference between a microscope that lasts a few weeks and one that can last for years. A number of microscopes will simply install the software and drivers themselves as soon as you plug them in. Then there are some that come with a CD you can use. Then there are poor quality microscopes that have softwares which are difficult to install and should be avoided. Of course, cost is another important factor, as it is for any purchase. Do you feel that the microscope is good value for money? Is what you get worth the price that you’ll be paying? If it isn’t then don’t bother wasting your money. The Plugable USB 2.0 Digital Microscope with Flexible Arm is a great choice for people of all ages and skill levels. It can be used to analyse your classroom, your stamp or coin collection, the parasites in your garden, and it can even be used to assist in micro-soldering. There are some unique features to the Plugable USB 2.0 digital microscope. For a start the flexible arm makes it so much easier to control. The microscope can also be controlled entirely through the compatible software and features a time lapse option. You can use this microscope to take time lapse videos and observe how things change over a long period of time. The camera is a high quality 2.0MP camera that works with almost any operating system and zooms in to an incredible 250x magnification, depending on the size of your monitor. The flexible arm makes it easy to operate the microscope. The microscope works perfectly with Windows, Mac, and even Android devices that support an OTG cable. The microscope comes with an adjustable built-in LED light and, unlike the other microscopes on our list, it shines the lights through a diffuser which means there’s no glare. You can study all the reflective objects you want with ease. A big problem with this microscope can be the resolution. The more a digital camera zooms in the worse the image quality, and this microscope can zoom in pretty far. It can also be annoying to focus the picture, which only serves to make the resolution issues worse. The field of view the microscope offers can feel a little small, making it difficult to see large objects such as coins. This likely isn’t the microscope for you if you want to analyse your stamp or coin collection. The plugable USB 2.0 digital microscope is a great all-round microscope given the price. If you’re looking for an intermediate microscope then you can find it here. It’s better than an entry level microscope but not quite as good as a professional one. There are some niggling issues the microscope has that are worth considering too, in particular the resolution issue. It zooms in quite a fair bit, but perhaps you want to avoid zooming in as much as possible here. The Dino-Lite Basic AM2111 is a great beginner digital microscope that is sure to please long time users too. It’s an upgraded version of the old AM2011 and is designed to be tougher and easier to use. 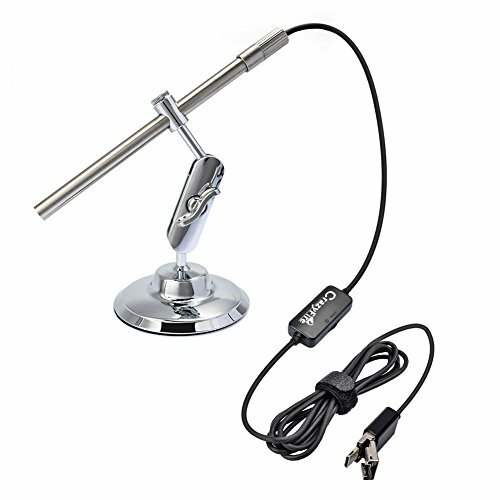 One unique feature of the Dino-Lite USB Handheld Digital Microscope is that it has a wide range of magnification. There’s no need to change the lens when magnifying with this digital microscope either. This is because it has a dial that you adjust as you move the microscope towards or away from the object you’re looking at. The closer you get to the object the better the magnification, all the way up to 200x magnification. 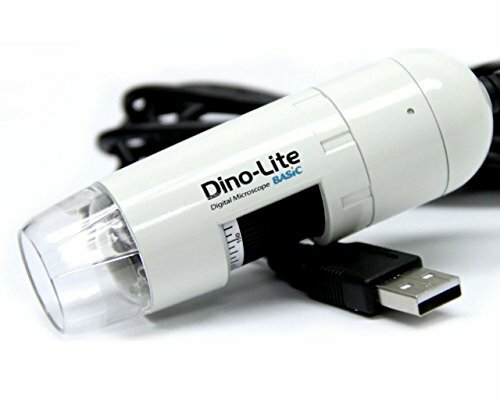 The Dino-Lite USB handheld digital microscope is super simple to use and kid-friendly. Even though it’s good for kids it’s also perfect for the professional scientist. The software included is easy to install and, despite being basic, does it’s job well. It makes it easy to save your videos and pictures and keeps everything perfectly organised. Perhaps the biggest con of this microscope is that, as good as the software is, it doesn’t work with iOS. So if you have an iPhone then this is not the microscope for you. It is possible to get it to work with an iPhone but you need to buy an adaptor that can cost more than the microscope itself, so it’s just not worth it. The Dino-Lite is a great microscope for first time users and is an ideal choice for kids. It’s simple to use and a lot of fun. However it’s not compatible with iOS and if you’re a professional then you might be interested in something a little more professional. It’s also pretty cheap depending on which model you choose. The price quickly increases as the quality does however the best version of the microscope is the 5MP MT MS PZ IC version. The Celestron 44302 deluxe handheld digital microscope 2MP is a little more intermediate than the Dino-Lite, but it’s still very easy to use and it doesn’t use up a lot of power either. It features a 2 Megapixel camera that you can use to take pictures of your discoveries. One of the more unique features of this microscope is that the software includes a measurement tool. It’s able to tell you how big what you’re looking at is. So you’ll always know the size of the specimen. The microscope features not just a camera, but also an LED illuminator. This ensures that your specimen will always be lit up and visible. Perfect for doing science in the dark. It also features a metal stand that keeps the microscope steady for you for high magnification viewing. It’s really cheap as well, which is very good value for money. While the software is compatible with both Windows and Mac computers, the measurement tool isn’t. It only works with Windows computers. So if you have a Mac and you like the sound of the measurement tool then you’re out of luck. The magnification range is also lackluster compared to the Dino-Lite as this microscope only magnifies to up to 40x. How much it magnifies depends on your monitor though. It’s capable of reaching a magnification level of up to 150x with some computer monitors. This microscope is another good choice for kids, and it has enough intermediate features to be good for teens. A great choice for people who want to analyse stamps, coins, rocks, skin, and circuit boards. It’s suitable for adults but, once again, the really serious scientist should probably choose something with a little more oomph to it. This USB microscope is the perfect portable video magnifier. It’s super simple to use as it’s just a case o plugging it in and playing. It features a fun pen design that makes it easy to pack up and store, ensuring you always have the tools to take a closer look. Something that really sets this microscope apart from the others on our list is that it is Android compatible. While the other microscopes we have to plug into the computer, this one can be plugged straight into your Android phone. The CrazyFire Digital USB Microscope is water resistant so it can be used in just about any environment you find yourself in. It features a 1MP 720p camera that makes it easy to capture images and videos of what you’re looking at for further analysis later. It also comes with a host of accessories including a bug casing, a small casing, and leakproof light sets. The software leaves much to be desired. It doesn’t work on some older Android phones and it can cause a false negative with some virus scanners. The good news is that it works perfectly with Windows Movie Maker but it seems like a hassle. The LED lights make it easier to look at objects in the dark but this backfires when you try to look at a shiny object and all you can see is the reflected light. You could also have to fiddle with the camera a little to get the image to focus and show up properly. This is a great entry level microscope at a price that can’t be beat. Given the portable nature of the microscope it’s a great choice for people who can’t resist taking a closer look at the world around them when travelling. If you’ve ever wished you had a microscope on you then this is the microscope for you. As long as you have an Android phone anyway. 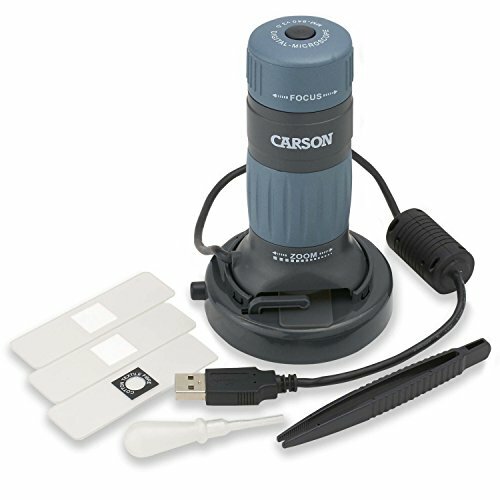 The Carson zPIX USB digital microscope is a powerful zoom microscope that comes with an incredible 35x-165x zoom magnification. The microscope features a 640×480 resolution digital camera you can use to capture images of what you see when you examine your specimens too. Unlike the other microscopes the zPix is perfectly compatible with both Windows and Mac devices. There’s no need to buy any additional accessories or lose functionality just because you aren’t using a Windows computer. The level of zoom the microscope can reach is pretty incredible. 165x magnification is good enough to get up close and personal with anything you can get your hands on. The package includes a lot of accessories including a specimen base, three blank sides and one prepared slide, forceps, eyedropper, and the USB cable you use to connect it to the computer. While the microscope is compatible with Windows and Mac devices it doesn’t work with tablets, so it’s not a perfectly mobile option. The software included in the microscope is only for Windows computers. Mac users will need to visit the Canon website and download the software manually, which is an inconvenience. Much like the Celestron microscope the maximum magnification level depends on the size of your monitor. You need a 21 inch monitor at least to zoom in to a full 165x. The zPix is an ideal basic microscope for anyone on any device. If you’ve got a good monitor then this is a good choice for the zoom level. It’s not a perfect microscope but, given the price and what you get or it, it’s still a very good microscope that’s worth the money. This one might not be as good for the young ones as the other microscopes we’ve looked at. 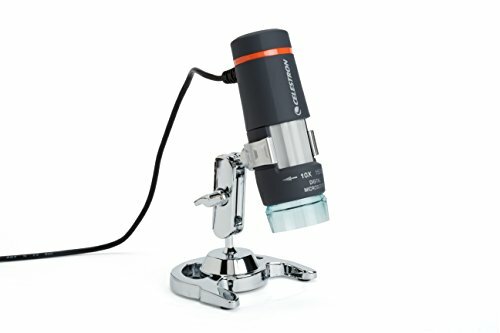 And there you have it; our look at the top five USB handheld microscopes on the market.Think about what you want out of your microscope and consider what we’ve said, along with what the reviews about the microscopes have to say, and you should have no problem making the right choice. There is no perfect microscope; only one that’s perfect for you.